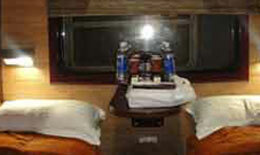 Ratraco Express Train is another top deluxe transportation service on the railway from Hanoi to Sapa. 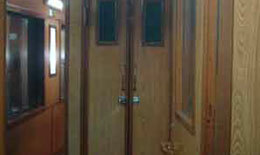 All carriages are wood-paneled inside and decorated with noble wood furniture which generates an atmosphere of coziness, glamour and high class to the customers. On each cabin, each objects and furniture is situated with the same purpose to ensure that the guests are staying under the most indulged and pleasant environment. 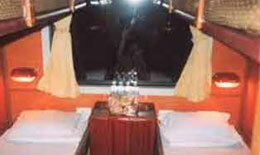 Moreover, they are exact duplication of 3-stars hotel rooms with pure berths, fresh blankets and pillow for the deepest sleep of the passengers, accompanied with the standard facilities like air conditioner or LCD TV for the leisure demand of them. 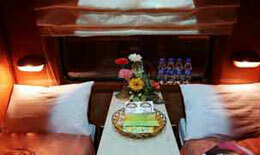 Additionally, the cabin attendants will further comfort the trip with their enthusiasm, hospitality and helpfulness. In spite of providing such a perfect train service to passengers with top deluxe advantage, the ticket fare to get on those carriages is quite reasonable.